As the days get shorter and the nights get longer, it’s easier to find yourself walking after dark. But you may not know that most pedestrian car accidents occur at night, when it’s difficult for motorists to see persons walking. Whether you’re leaving the office, heading to a nearby restaurant or taking the children trick-or-treating on Halloween night (being hit by a car remains the second most common injury-related death among children), here are a few tips to keep in mind. Always carry a flashlight. Even in well-lit areas, flashlights help motorists to see you. Many smartphones include a feature to turn your camera flash into a light — use it. Wear reflective clothing. We get it — reflective clothing might not be the most fashionable attire to wear to dinner, but it could save your life. If the weather is cooler, just throw on a jacket with reflective strips — you’ll take it off when you sit down for dinner anyway. Stay in well-lit areas, when possible. If you cannot remain in a well-lit area for your entire walk, try to wait to cross the street until you are in a well-lit area. This helps to ensure the motorist will see you. Cross at marked crosswalks or intersections, if possible. Motorists expect to see pedestrians crossing here. Avoid crossing near buses, hedges, parked cars or other obstacles where drivers may not see you before you cross. Don’t assume motorists will stop. Even at intersections when you have a green light to walk, look both ways to make sure traffic is stopped. Motorists may be easily distracted or may intentionally run a red light. At crosswalks, wait for the driver to come to a complete stop before crossing. Use all of your senses / avoid distractions. Don’t wear headphones or walk and text. Being able to hear and see your surroundings is crucial to your safety. It’s easy to come upon a street crossing and walk in front of a moving vehicle when you’re not paying attention. Half of all pedestrians killed while walking at night were legally drunk, according to the Insurance Institute for Highway Safety. Walking is extremely dangerous for someone with a lack of balance and reasoning ability, both of which make it easier to slip on ice, tumble down stairs or cross in front of moving traffic. The best way to stay safe is to stay sober, whether driving or walking. 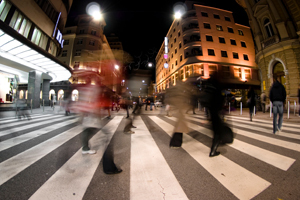 If you or someone you know is in a pedestrian car accident, we can help. Contact one of our skilled attorneys 24/7 for the Results You Deserve®.